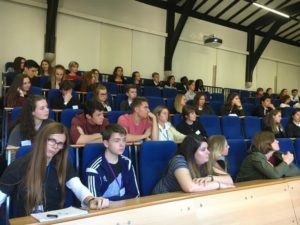 Working in partnership with the University of Kent, the King’s School has recently established the fledgling ‘East Kent Philosophy Teachers’ Network’, the purpose of which is to promote philosophical enquiry in local schools and to encourage greater communication and cooperation between those involved in the teaching of philosophy. In October we staged the network’s first major event here at the King’s School: a Philosophy conference for 6th form students. Around 150 visitors arrived in the morning sunshine to join 40 of our own Philosophy and Religious Studies students and follow a busy day-long schedule of short talks, activities and conversation with other philosophers. Several lecturers came from the Philosophy Department at the University of Kent to give us the benefit of the expertise in areas such as the problem of free will, and the ethical issues surrounding euthanasia and criminal punishment. We were also lucky to have authors of the A level Philosophy text books who led sessions exploring philosophical ideas through games. Students from the University also came to give advice on how to write like a philosopher and to answer questions about undergraduate study for those who might be considering continuing their philosophical studies after 6th form. Teachers were provided with their own parallel sessions looking into ways of best delivering aspects of the Philosophy and Religious Studies specifications and sharing ideas on how to engage students in philosophy and to prepare them for their exams. The day ended with some very impressive presentations from the students from Kent College and Dover Girls’ Grammar as well as from King’s school pupils on topics of their own choosing for which small prizes were awarded. We are looking forward to next year’s conference and to future East Kent Philosophy Teachers’ Network events.